One thing many iPhone, iPad owners hate about the device is that they must use iTunes if they want put files such as music, video, or photo to their iOS device. There are many reasons iTunes gets hated by those users and one of the most common one is that if you sync your iPhone with iTunes on a computer then you won’t be able to sync the iPhone with iTunes on a new/another computer unless you erase all the files in the phone. This becomes a big problem if the computer synced with your iPhone gets stolen or damaged and you get a new computer. Fortunately,users with jailbroken iPhone, iPad and iPod touch won’t have to worry about this problem anymore with new app that allows the iPhone, iPad or iPod touch to get sync with as many iTunes as you want without having to erase data on device. The application is called MultiTunes and is very simple to use after you download it. When you download the app and launch it from the iPhone’s home screen, it shows you the default iTunes library. Then you will see Additional Libraries where it shows you a list of libraries you’ve added apart from the default iTunes library. You will need to add the additional library selecting the add button and then typing the name of the library. After that, you can sync the device with that library and still keep old files from your iTunes libraries. Files won’t get mixed, you can select which libraries you want to see files from and it will display all files from that libraries. So you can sync with as many different iTunes libraries as you want as long as you have enough space. You should know that contents from iTunes and apps from the App Store won’t be synced, as the creator of the app warned. IMPORTANT: Before downloading content from the iTunes or App Store apps, make sure your default library is selected in this app. Otherwise, your content may not download properly. 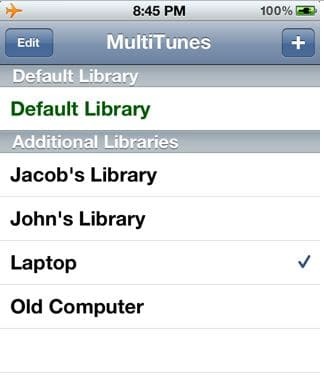 MuliTunes can be downloaded from Cydia from the BigBoss repo for free.